A car espresso maker in Thalia's car! Many mums feel the same. First school day is hard. You leave your children to start a new school year after long and nice summer vacations together. Thalia, the famous Mexican Pop singer living in NYC shares these moments and personal feelings with her followers on Instagram in a very natural way. She sends photos with her own comments as well as a surprising video: she hums while serving herself an espresso with her brand new car espresso maker. That's how she copes with her emotions. As a true Mexican, she is a coffee lover. She reveals how she gets through the day: with coffee! Not any coffee but with a real espresso in the car with her brand new Handpresso Auto Capsule will save her day! Handpresso Argentina who has followed her for years knew she was a coffee aficionado and sent her this car espresso maker using capsules. She was right because Thalia's mood switched around once she got caffeinated. "In true star fashion, the Mexican songstress flaunted an incredible device that allowed her to brew a fresh cup of joe right in her car. Using the cigarette lighter, Thalia called upon Handpresso Auto Capsule... " and was thrilled! 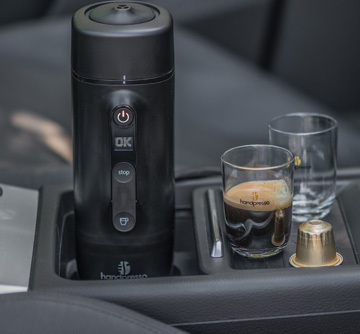 Handpresso Auto Capsule is equipped with the latest innovations from the French portable espresso leader. It is the first onboard coffee maker using espresso capsules, ie nespresso® or nespresso® compatible capsules. This 12/24V espresso machine is more than a beautiful gadget with an attractive design. A perfect fit inside your car, it plugs into the cigarette lighter and sits in the cup holder. It requires no more than 2 minutes and a half to prepare a perfect espresso. You can follow the preparation cycle digitally and there is an electronic water filling control. It's stone sure that it will make the driver and its passengers happy... as shown by Thalia's video. Coffee habits are really unique to each country and even to every consumer. Do you go for long coffee, short coffee, cappuccino ? The Handpresso Pump set was thoroughly tested by the American coffee blog Coffeesphere. Read the review ending with: "I would recommend it to anyone looking for a quality espresso on the go. ANYWHERE"
Why it’s an emotional week for Thalia and the incredible way she’s getting through it: using an on-board espresso machine and serving herself a good espresso in the car! Будем стараться предложить лучшее: товары и наши услуги. Чтобы Ваш подарок стал незабываемым, исключительным и полезным.